Who is eligible to use the EduCanada brand? 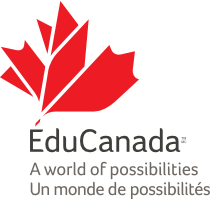 EduCanada is a brand that supports the international education offerings of Canadian provinces and territories. The EduCanada brand is the result of collaboration between the provinces and territories through the Council of Ministers of Education, Canada (CMEC), and Global Affairs Canada. It is a protected trademark of the Government of Canada and is subject to a Master Licence Agreement between the parties. Any unauthorized reproduction is prohibited. Global Affairs Canada and CMEC jointly established a Brand Use Eligibility Policy which ensures that only those institutions and organizations that represent excellence and provide assurance of quality are eligible to use the brand. Please consult the list of eligible institutions. Two types of users with distinct levels of access to the brand have been identified. The first type comprises the federal government, i.e. Global Affairs Canada and the provincial partners, which through the CMEC are authorized to use the entire brand communication platform. The second type comprises educational institutions and organizations authorized to use the brand logotype through an agreement with the CMEC. The Government of Canada and Global Affairs Canada are committed to providing websites that respect the privacy of visitors. This privacy notice summarizes the privacy practices for Global Affairs Canada's online activities. The nature of the Internet is such that web servers automatically collect certain information about a visit to a website, including the visitor's Internet Protocol (IP) address. IP addresses are unique numbers assigned by Internet Service Providers (ISP) to all devices used to access the Internet. Web servers automatically log the IP addresses of visitors to their websites. The IP address, on its own, does not identify an individual. However, in certain circumstances, such as with the cooperation of an ISP, it could be used to identify an individual using the website. For this reason, the Government of Canada considers the IP address to be personal information, particularly when combined with other data automatically collected when a visitor requests a web page such as the page or pages visited, date and time of the visit. Unless otherwise noted, Global Affairs Canada does not automatically gather specific information from you, such as your name, telephone number or email address. Global Affairs Canada would obtain this type of information only if you supply it to us, for example, by email or by filling in a contact form. In such cases, details about how your personal information is handled will be provided in a Personal Information Collection Statement. In cases where services are provided by organizations outside of the Government of Canada, such as social media platforms or mobile applications, IP addresses may be recorded by the third-party service provider’s web server. If you choose to send Global Affairs Canada an email or complete a feedback form online, Global Affairs Canada uses your personal information to respond to your inquiry. The information you provide will only be shared with another government institution if your inquiry relates to that institution. Global Affairs Canada does not use the information to create individual profiles nor does it disclose the information to anyone other than those in the federal government who need to provide you with a response. Any disclosure of your personal information is in accordance with the Privacy Act. Global Affairs Canada's use of social media serves as an extension of its presence on the Web. Social media account(s) are public and are not hosted on Government of Canada servers. Users who choose to interact with us via social media should read the terms of service and privacy policies of these third-party service providers and those of any applications you use to access them. Global Affairs Canada uses Facebook, Twitter, YouTube, LinkedIn, Flickr, Foursquare, Weibo, BuzzFeed and Storify. Personal information that you provide to the Government of Canada via social media account(s) is collected under the authority of the Financial Administration Act and the Canada Border Services Agency Act. This information is collected to capture conversations (e.g. questions and answers, comments, "likes", shares and retweets) between you and Global Affairs Canada. It may be used to respond to inquiries, or for statistical, evaluation and reporting purposes. Comments posted that violate Canadian law will be deleted and disclosed to law enforcement authorities. Comments that violate our rules of engagement will also be deleted. The personal information is included in Personal Information Bank Outreach Activities (PSU 938). They allow a website to recognize a previous visit each time the visitor accesses the website. Global Affairs Canada uses sessional and persistent digital markers on some portions of its website. During your online visit, your browser exchanges data with Global Affairs Canada's web server. The digital markers used do not allow Global Affairs Canada to identify individuals. You may adjust your browser settings to reject digital markers, including cookies, if you so choose. However, it may affect your ability to interact with Global Affairs Canada's website. Web analytics is the collection, analysis, measurement and reporting of data about web traffic and visits for purposes of understanding and optimizing web usage. Information in digital markers may be used as part of web analytics to remember your online interactions with Global Affairs Canada’s website. Global Affairs Canada uses Google Analytics and the information collected is disclosed to Google, an external third-party service provider. Your IP address is anonymized prior to being stored on the service provider's servers in order to help safeguard your privacy. The information collected is de-personalized by activating the anonymization feature in Google Analytics. Data collected for web analytics purposes goes outside of Canada to the United States of America and may be subject to the governing legislation of that country, such as the USA Patriot Act (PDF). Information used for web analytics is collected pursuant to the Financial Administration Act. Such data may be used for communications and information technology statistical purposes, audit, evaluation, research, planning and reporting. For more information on how your privacy is safeguarded in relation to web analytics, see the Standard on Privacy and Web Analytics. Global Affairs Canada employs software programs to monitor network traffic to identify unauthorized attempts to upload or change information, or otherwise cause damage. This software receives and records the IP address of the computer that has contacted our website, the date and time of the visit, and the pages visited. We make no attempt to link these addresses with the identity of individuals visiting our website unless an attempt to damage the website has been detected. Any questions, comments, concerns or complaints you may have regarding the administration of the Privacy Act, and privacy policies regarding Global Affairs Canada’s web presence may be directed to our Access to Information and Privacy Division. If you are not satisfied with Global Affairs Canada’s response to your privacy concern, you may wish to contact the Office of the Privacy Commissioner of Canada by telephone at 1-800-282-1376. To improve the functionality of Government of Canada websites, certain files (such as open source libraries, images and scripts) may be delivered automatically to your browser via a trusted third-party server or content delivery network. The delivery of these files is intended to provide a seamless user experience by speeding response times and avoiding the need for each visitor to download these files. Where applicable, specific privacy statements covering these files are included in Global Affairs Canada’s Privacy Notice. The Official Languages Act, the Official Languages Regulations (Communications with and Services to the Public) and Treasury Board policy requirements guide our use of English and French when we provide services to or communicate with members of the public. When there is no obligation to provide information in both official languages, content may be available in one official language only. Information provided by organizations not subject to the Official Languages Act is in the language(s) provided. Information provided in a language other than English or French is only for the convenience of our website visitors. Links to websites not under the control of the Government of Canada, including those to or from our social media accounts, are provided solely for the convenience of our website visitors. We are not responsible for the accuracy, currency or reliability of the content of such websites. The Government of Canada does not offer any guarantee in that regard and is not responsible for the information found through these links, nor does it endorse the websites and their content. Visitors should also be aware that information offered by non-Government of Canada websites to which this website links is not subject to the Privacy Act or the Official Languages Act and may not be accessible to persons with disabilities. The information offered may be available only in the language(s) used by the websites in question. With respect to privacy, visitors should research the policies of these non-government websites before providing personal information. Exercise due diligence to ensure the accuracy of the materials reproduced. Indicate the complete title and author (where available) of the materials reproduced. Indicate that the reproduction is a copy of the version available on Global Affairs Canada’s website (and provide the URL). Unless otherwise specified, you may not reproduce materials on this website, in whole or in part, for the purposes of commercial redistribution without prior written permission from Global Affairs Canada. Some of the content on this website may be subject to the copyright of another party. Where information has been produced or copyright is not held by the Government of Canada, the materials are protected under the Copyright Act and international agreements. Details concerning copyright ownership are indicated on the relevant page(s). The official symbols of the Government of Canada, including the Canada wordmark, the Royal Coat of Arms of Canada and the flag symbol, may not be reproduced, whether for commercial or non-commercial purposes, without prior written authorization. This notice has been written to explain how Global Affairs Canada interacts with the public on social media platforms. We use our social media accounts as an alternative method of sharing the content posted on our website and interacting with our stakeholders. By using our social media accounts (by following, liking or subscribing), you can expect to see information about the programs and services we provide. Any communications activity during holidays, after core hours and on weekends would likely be related to an emergency or of an urgent nature (of significant value to our followers and subscribers). Otherwise, the accounts will be relatively inactive during these times. Our social media accounts may post or display links or ads for websites that are not under our control. These links are provided solely for the convenience of users. The Government of Canada is not responsible for the information found through these links or ads, nor does it endorse the websites or their content. Our decision to follow, favourite or subscribe to another social media account does not imply an endorsement of that account, channel, page or website, and neither does sharing (retweeting, liking, reposting or linking to) content from another user. At this time, Global Affairs Canada's decision to follow, favourite or subscribe will be limited to other Government of Canada institutions and organizations determined to be relevant to our followers or subscribers and to Global Affairs Canada's mandate. We will share (retweet, repost, like or link to) information posted by accounts that are diverse, non-commercial, non-partisan and of value to our followers and subscribers. In short, please be respectful and make sure that your comments are relevant to where they are posted. The views of users commenting on our social media accounts do not necessarily represent the views of Global Affairs Canada or the Government of Canada. Also, please note that you participate in social media at your own risk, taking personal responsibility for your comments, your username and any information provided. To protect your own privacy and the privacy of others, please do not include full names, home phone numbers or email addresses, photographs containing images of identifiable individuals or any other personal information in the body of your comment. Global Affairs Canada may share links that direct users to websites of organizations or other entities that are not subject to the Official Languages Act and available only in the language(s) in which they are written. When content is available in only one language, we make an effort to provide similar content in the other official language. For general questions please contact us. You may also find useful information on our Help page. Reporters are asked to send questions by phone to Global Affairs Canada Media Relations at 343-203-7700 or by email at media@international.gc.ca.